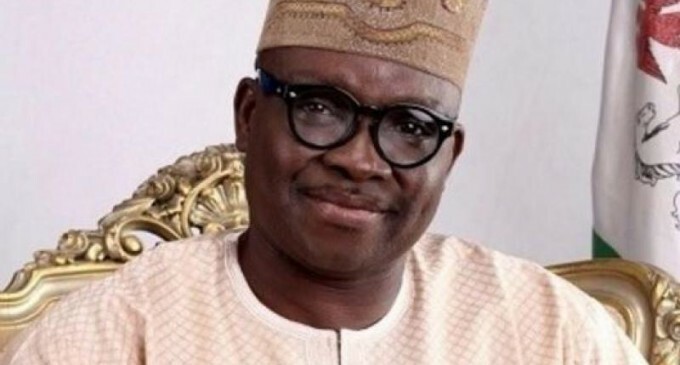 The Ekiti State Governor, Mr. Ayodele Fayose, said he had learnt his lessons from his initial support for the embattled factional National Chairman of the Peoples Democratic Party, Senator Ali Modu Sheriff. Fayose said this when the ex-chairman of Daar Communications, Chief Raymond Dokpesi, took his PDP national chairmanship campaign to Ekiti. He said, “I must tell you that I have learnt my lessons from my past experience. I will not openly identify or campaign for a candidate any longer. As part of our great party in Ekiti, I ‘m assuring you that I do not have a personal candidate and God knows I have not spoken to my people about any candidate. “We will allow God to choose for us this time by ensuring that all aspirants have a level-playing ground. Fayose, while expressing concerns about the crisis rocking the party, lamented that some people were merely paying lip service to reconciliation efforts in the PDP because of selfish interest. Dokpesi pleaded with the delegates to allow him to serve the party and return it to the winning ways. According to him, since the last general elections, the All Progressives Congress has not allowed the PDP leaders to rest, urging members of the party to stand and defend democracy in the country. Dokpesi also denied stepping down for a former National Vice-Chairman of the party, Chief Bode George. He stated, “Some people have alleged that I have surrendered for our elder in the party, Chief Bode George. Let me make it categorically clear that I was born and bred in Ibadan and I do understand and appreciate the Yoruba traditions so much and so I have respect for elders. “But there was no time that Chief Bode George and I met and discuss this issue and I did not in any way surrender the race to him. I have not stepped down for him in any way because this time we need fresh and younger blood that would have the physical and mental alertness for the job. Meanwhile, the Chairman, Board of Trustees of the PDP, Senator Walid Jibrin, has faulted insinuations that Sheriff was planted by some unseen forces to destroy the party. He said at Sherrif’s age, nobody could have planted him to destroy a party, which was built by great Nigerians, both living and dead. Jibrin, however, noted that God would not forgive anyone who wanted to destroy a party that governed Nigeria for 16 years. The BoT Chairman, who spoke to newsmen in Kaduna on Friday, said in spite of the Thursday’s ruling by Justice Okon Abang of the Federal High Court in Abuja, the August 17 National Convention of the PDP in Port-Harcourt, Rivers State, would hold as planned. Jibrin, who expressed shock over the judgment, said preparations were in top gear to ensure a hitch-free convention. He noted that the judge had the right to give judgment while the party had the rights to appeal the judgment.